This post contains affiliate links. That means if you click on the link, and buy a Bosch Universal Plus mixer, for example, you’re helping keep my content free to my readers. And maybe I can keep the lights on. 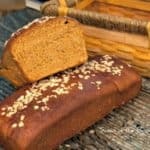 I received a brand new Bosch Universal Plus mixer to review, and in this post, I used it to make my whole wheat bread recipe, that I’ve been making for years. I want to be clear that even though I fell in love with this mixer, all opinions are strictly my own. No one’s paying me to say any of this. So there. 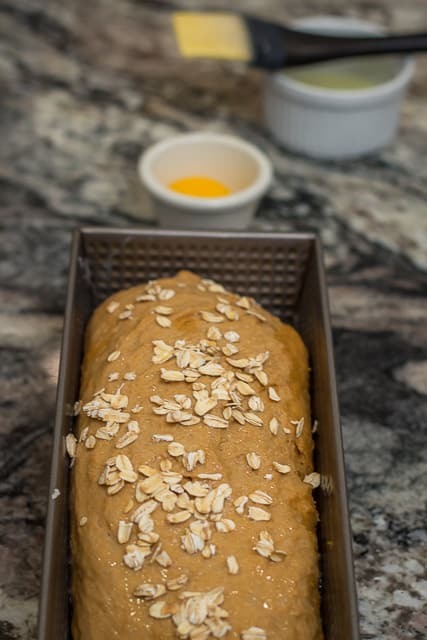 This is the fourth and final in a series of posts on making whole wheat bread from freshly ground whole wheat flour, and this post contains…. the recipe! 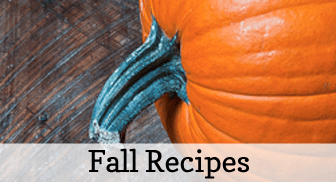 And it’s the recipe, I’d guess, that is what the admirably long-suffering readers of my other three posts have been beyond patiently waiting for! Because in my estimation, it’s time to stick a fork in this tutorial, and call it done! The goal set before you. In case you’re joining the rest of us for the first time, here’s a recap. The first post dealt with the grain mill itself, and contained a sweet deal on purchasing a NutriMill. 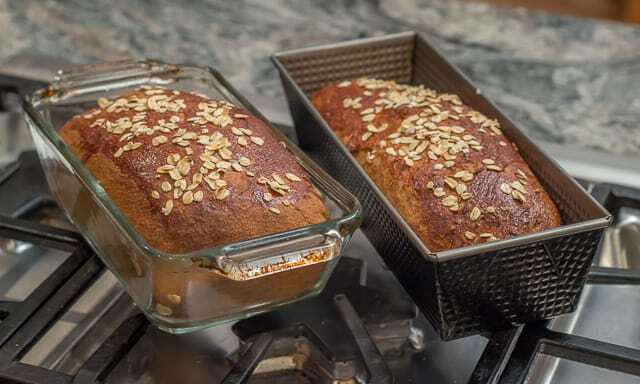 The second post offered information in regard to the types of wheat berries that are available, and I specified my own personal preference: the ones I find best suited, in fact, for this very recipe. 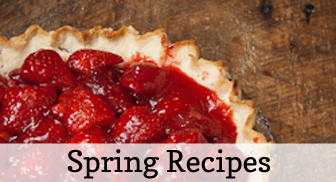 The third post involved lots of other incidental facts that had to do with ingredients such as sweeteners, yeast, and how I handle wheat berry and flour storage. But THIS post, this fourth in the series, I am happy to say, is perfectly usable as a stand-alone post. 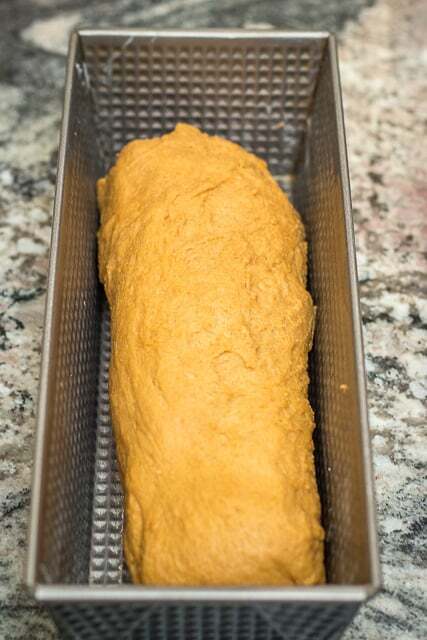 It’s also suitable for anyone who is UNINTERESTED in the whole freshly milled flour thing, because the recipe I’m going to give you today can easily be used with store bought flour. Before we get going, though, there is one more ingredient I’d like to discuss with you: freshly ground flax seed. First off, let me start out by saying that this recipe does not NEED the flax seed I’ve included in it. So if you want to omit that from the recipe, because you don’t have any, that’s just fine. You should go ahead and bake your bread. 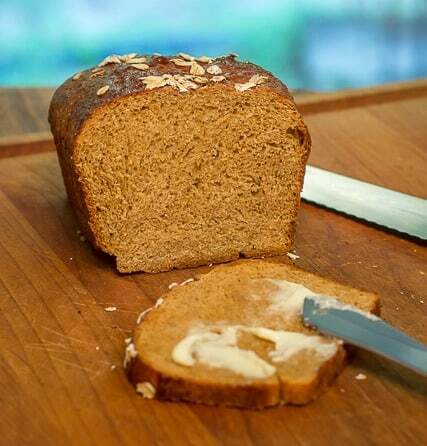 HOWEVER….I’ve started adding freshly ground flax seed to my whole wheat bread. There are several things I think you might like to know about the importance of flax seed. The dietician at the hospital where my husband had his coronary bypass surgery told us to be sure to use flax seed to help my dear husband raise his HDL: his healthy cholesterol. (The HDL carries the bad cholesterol out of your blood and to your liver, where your liver can dispose of it, instead of allowing it to build up in your veins and arteries. So, as you can imagine, my husband and I are both interested in eating more flax seed, in smoothies as well as in our whole wheat bread. But here’s the kicker: If you don’t grind flax seeds, for the most part, the flax seeds will pass through your body without you gaining any nutritional benefit, except for the occasional seed that happens to get crunched by your teeth. The benefit that comes from the flax seed is found in the oil that comes from within the broken or ground seed, and the flax seeds need to be freshly milled/ground, so that the oil doesn’t have time to oxidize. Lest you think that this is another promotion for a grain mill, I assure you, it’s not! Pay attention now, because this is important. If you have a grain mill, you can’t mill flax seed in it, according to my Nutrimill manufacturer. So, what’s a freshly milled flax seed oil wanting person supposed to do??? 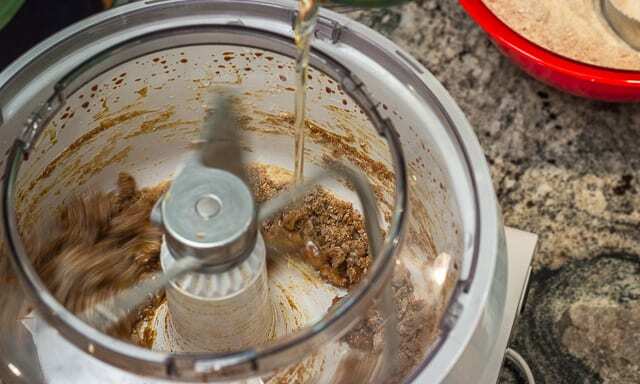 If you want freshly milled flax seed, do it in your blender or VitaMix or in a coffee grinder that you’ve cleaned out or designated for grinding spices (thanks for that tip, Melissa!). One other reminder about sweeteners, that I’ve already covered in earlier posts: for this recipe you may use whatever sweetener you prefer. If you’re opposed to sugar, substitute what you like (honey, agave nectar or whatever). 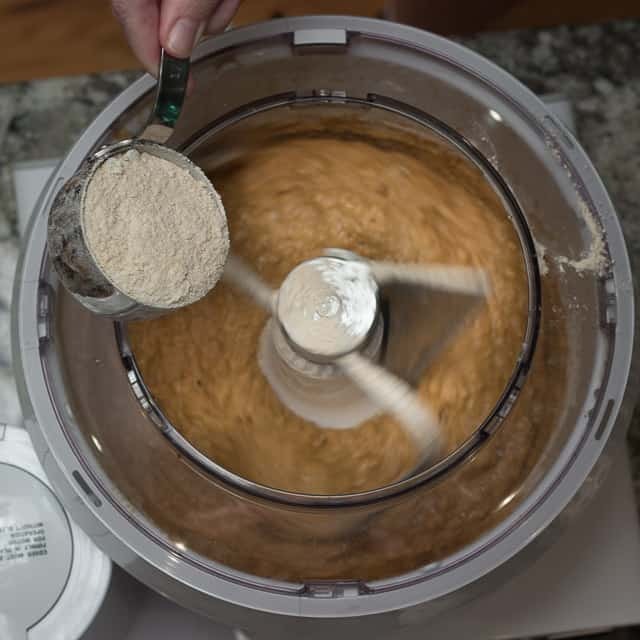 What Kind of Mixer Do You Use to Make Whole Wheat Bread? I have an old mixer, whose brand name shall go unmentioned, that I used to use to knead my bread, and it worked OK, but two loaves of whole wheat bread were its absolute limit. It would start smelling and feeling hot by the end of the kneading. 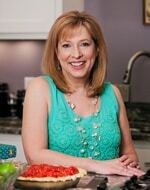 With this recipe, you can certainly knead by hand if that is your preference. 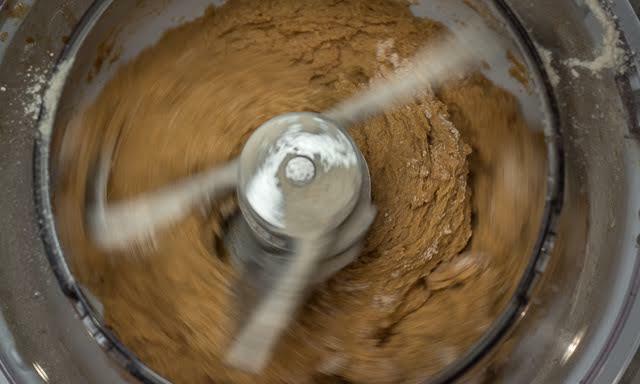 However, these days, now that I am LOVING my brand new Bosch Universal Mixer, that’s what I use. It has a larger capacity than my old mixer did, is so much more stable, and I absolutely love it! And my readers can get a special price on it. Click the link for further information. I am absolutely 100% convinced that for those who want to bake bread, the Bosch mixer is the way to go!!! Did you read that last item??? The ice cream maker attachment! Your family will rise up and call you blessed! 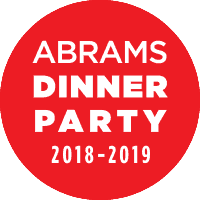 I haven’t used mine yet, but that’s next on my “to do” list: come up with a yummy ice cream recipe, and try out using the Bosch Ice Cream Maker attachment bowl that comes with your Bosch Summer Essentials package. 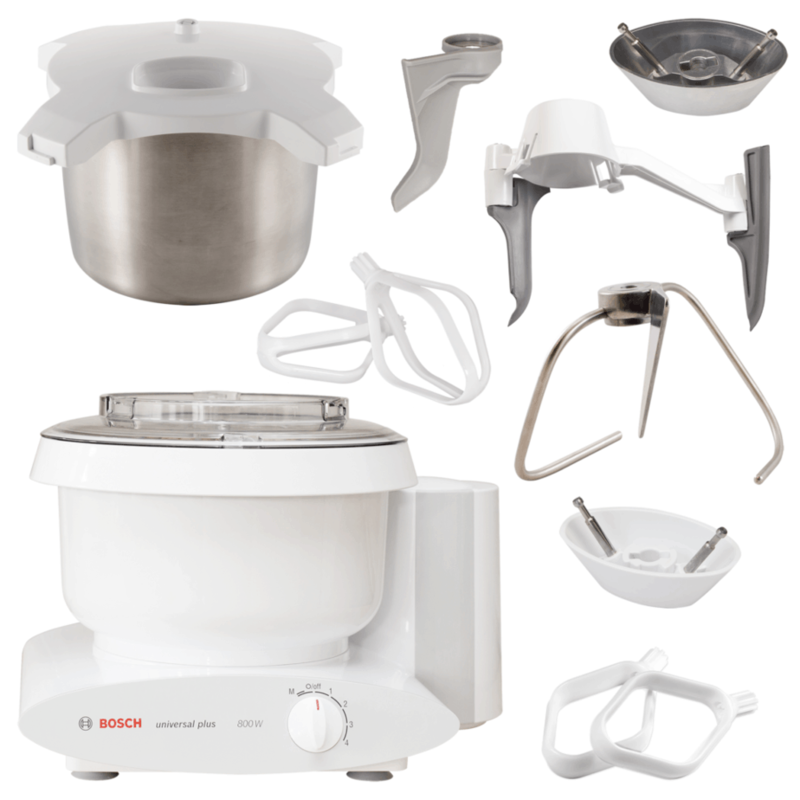 This package – the mixer, all the attachments, including the ice cream maker attachment – is available on BoschMixers.com for $510, but because you’re one of my readers, you can have an exclusive coupon $106 OFF! That’s over 20%! That means you’ll receive the Universal Plus Stand Mixer, which retails for $399, AND all of these great attachments for only $5 more! Now, on to the long promised recipe. The basic framework of this recipe came from a recipe I found on Epicurious, but I have altered it to suit my family. If you try it, I believe you’ll say it was worth the wait. 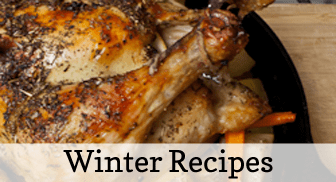 I’ve tried many recipes, but this one is the best I have ever tried, and you don’t even need to add vital wheat gluten (an extra ingredient that many recipes call for to help the bread rise). 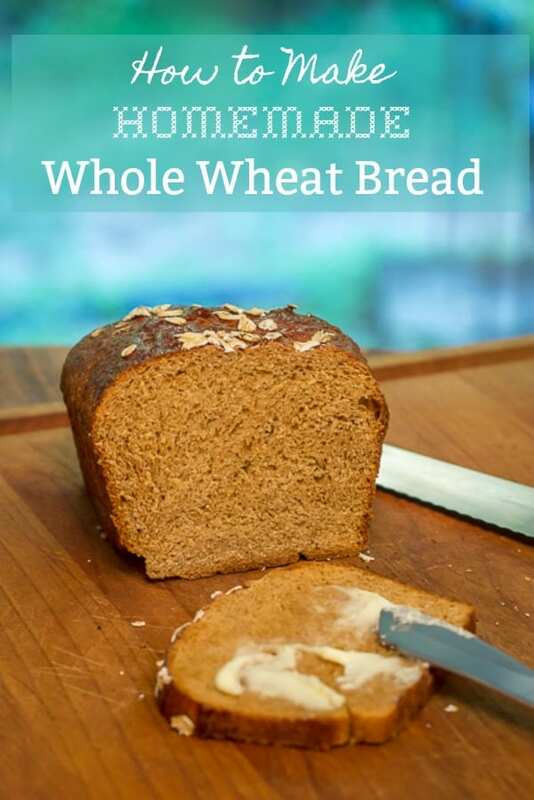 Part 4 of my 4 Part Tutorial on How to Make Homemade Whole Wheat Bread: the Recipe. 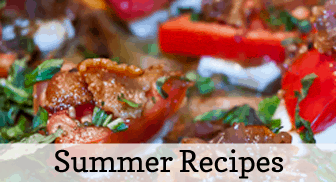 I’d really appreciate if you’d share this recipe with your friends. In a pyrex mixing cup, stir together the 1 3/4 c. warm water, the 1 t. sugar, and the yeast. 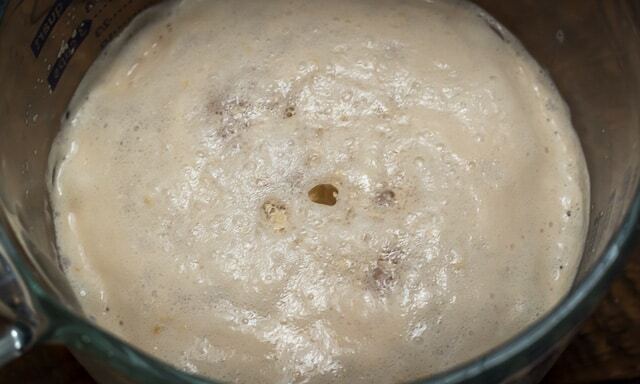 Let stand until yeast is bubbling, about 5 minutes. In another mixing cup or small bowl, whisk together the 1/4 c. molasses and the 1/4 c. warm water. Set aside. In a mixer bowl, using the dough hook, and the dough hook extender, stir together on low 2 c. of the flour, the sugar, flax seed and the salt. Pour in oil, and then the molasses and yeast mixtures. Stir well, and stop mixer to scrape bottom of bowl. Turn mixer back on low, and add enough of the remaining 3 to 4 cups of flour, 1/2 cup at a time, to form a soft dough. Turn mixer off and replace paddle attachment with dough hook. Knead dough on low for 10 minutes. Dough should have cleaned the side of the bowl, and be smooth and elastic. Shape dough into a ball. Punch dough down, and let rise another hour. Preheat oven to 400º, and grease 2 loaf pans. Divide dough ball in half. 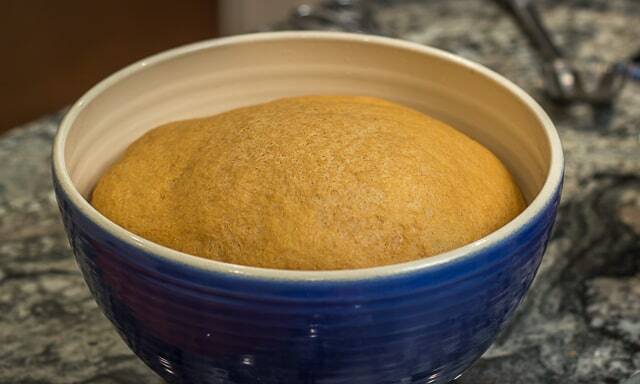 Form dough balls into oval loaves. Transfer loaves to pans, and let rise, covered with kitchen towels, 45 minutes. 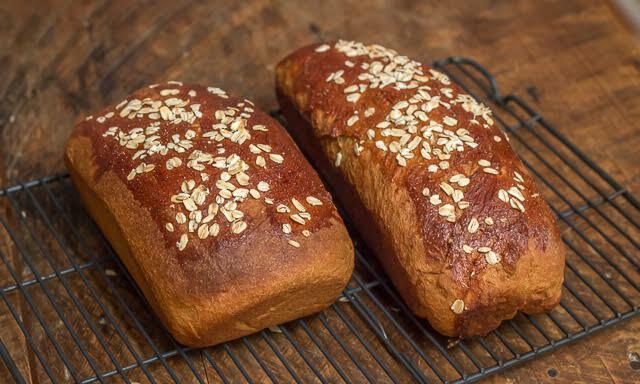 Brush tops of loaves lightly with egg wash, and sprinkle with oats. Bake loaves in middle of oven 10 minutes. Reduce oven temperature to 350º and bake loaves 20 to 25 minutes more, or until golden brown. Turn loaves out onto a rack to cool. The dough hook extender on the Bosch mixer helps you do smaller batches of bread really well. It does a great job of scraping the bottom and sides of the mixing bowl. Just a few pictures, to illustrate the process. “Proofing” yeast means allowing the yeast to “prove” to you that it’s potent and alive, before you add it to your batch of dough. Adding oil to my flour, in my Bosch mixer. Giving things the big old whirr. I’ve been kneading it a while, and the dough is still sticky enough that it needs a bit more flour. 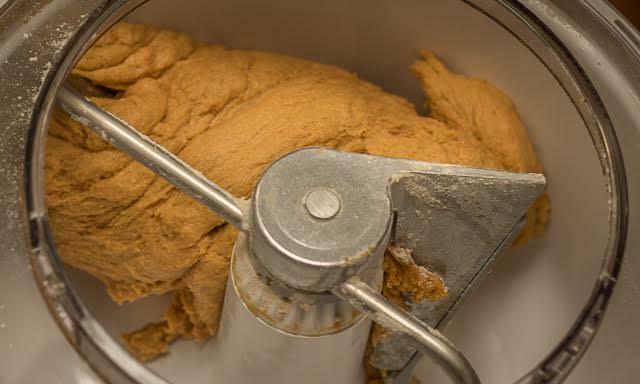 Here you can see the dough, forming a dough ball, on the dough hook, as it cleans the sides of the bowl. I have oiled the dough ball, and placed it in my oiled mixing bowl to rise. I cover the bowl with plastic wrap, while it’s rising in a warm place. 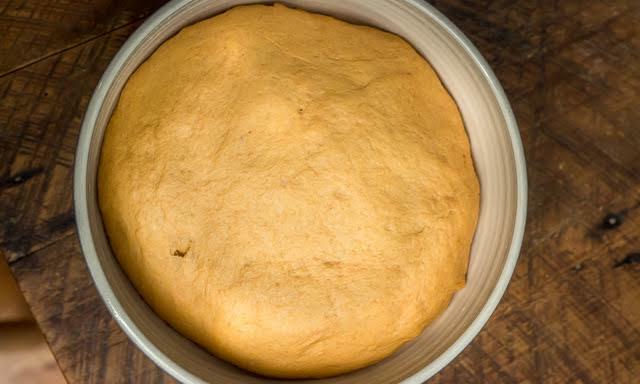 Here, we have the risen dough. Alleluia! Here, I’m gently taking the wind out of his sails. Also known as punching the dough down, although it should be more gentle than a punch. You’re redistributing those yeastie boys, and giving them some more sugar to digest. The second rise. He’s even more full of himself than he was before! 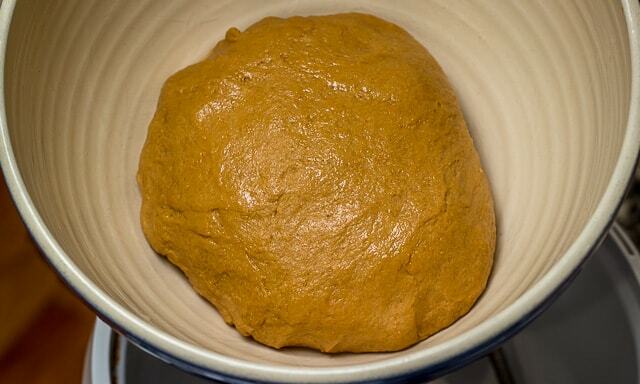 I’ve shaped it into a long oval shape, and placed it into a greased loaf pan, for its last rise. After that final rise, it’s ready for its brushing of egg wash, and its sprinkling of oatmeal. Fresh out of the oven, but still in the pan. De-panned, and cooling on the racks.